I haven't worn this baby doll dress in ages and I am so glad I rediscovered it in the back of my closet. And for once I can say it has been put to good use. I mean this doesn't get any cuter than with a baby bump inside. And I am sure my baby girl is feeling quite cozy in there, with plenty of room to breathe. 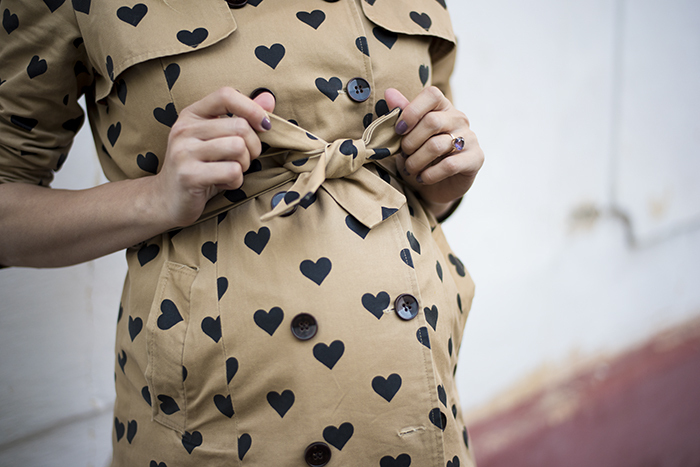 I am quite surprised I can still wear my heart print trench coat as well, but then again my baby bump is quite small for 8 months I guess. Unfortunately the coat is sold out, but I left a link down under just in case you wanna keep an eye out for when it comes back in stock. really lovely look! love the trench coat! What a gorgeous your are!